this dress is possibly Em’s favorite dress that i’ve ever made her. pink? check. purple? check. polka dots? check. ribbon? check. twirl? mega check. i actually made it for our early december trip to the nutcracker. if i remember correctly, a night before the performance i got a bee in my bonnet to make her a “sugar plum fairy dress” and i just dropped everything and went for it. 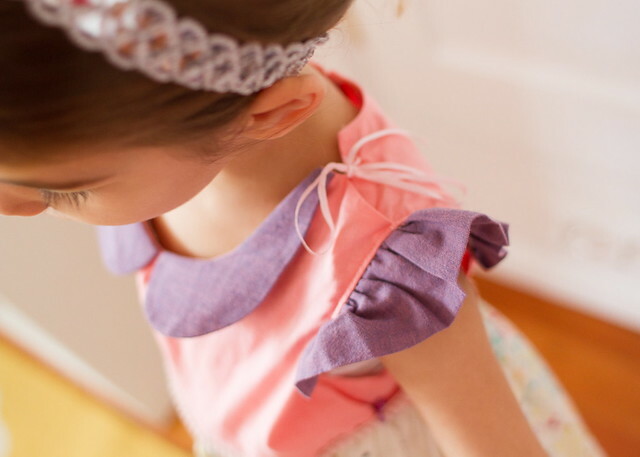 the sugarplum fairy is her favorite character in the ballet, and what could be more perfect than see kate sew’s adorable sugarplum dress pattern, i ask you?! NOTHING. seriously you guys, this thing is such a cute pattern to put together. 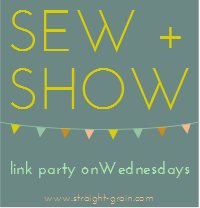 i just loved it as i sewed, it’s super adorable and no-fuss (that means no closures – it ties at the shoulders with ribbon!). i love the flutter sleeves, i love the peter pan collar, i love the twirly skirt. i almost couldn’t stand how cute every little part of it was. i made it in a 4T which was actually a mistake on my part – i never sew 4T for her and i’m not sure what i was thinking, the bodice is way too big. i had to put a pleat at the collar and at the back neck to get it to fit, which bugs me but SHE DOES NOT CARE. the pink bodice fabric is batiste, the purple collar and sleeves are shot cotton. 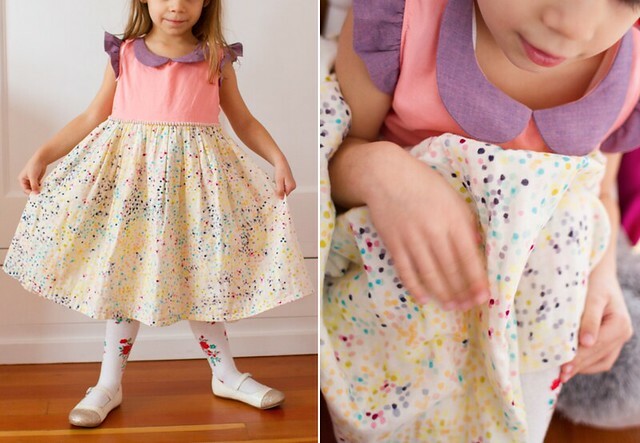 the skirt is the best part – it’s nani iro double gauze. i meant to make something for myself from it, but you know how it goes – it was perfect for this dress so i cut it. i got it on sale at bolt, and i found what might be the same colorway (but it’s hard to tell) online at the village haberdashery, and the blue/yellow version at miss matatabi and nido. since the waist was a bit big, i handsewed a mini ball trim to the seam for fun (and functional!) cinching. adding those special details are the best parts of sewing, i think. 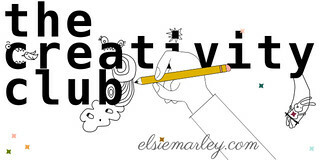 this one might hold the record for longest period of time between making and blogging so far – made in early december, blogged in mid march. it’s not for lack of being loved and worn – sometimes the most loved garments are the hardest to blog since they’re so often in use! and this dress looks more springy than christmasy anyway, right? since i made it too big, it’s got plenty of growing room. WIN. 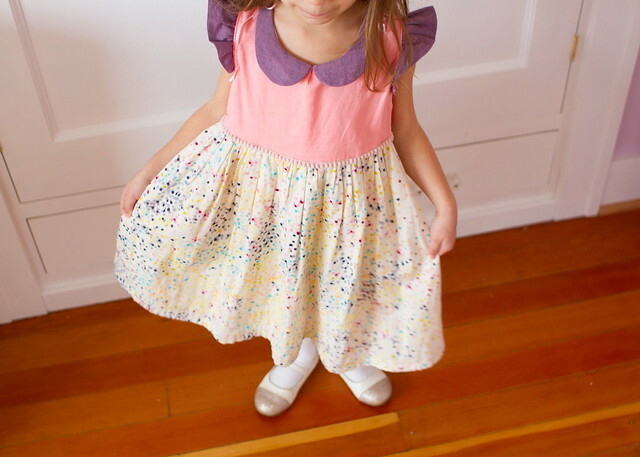 the sugarplum dress and top pattern by see kate sew runs sizes 3m – 6yrs and would be the perfect little Easter dress, right? Wow, can’t blame her…it it absolutely amazing! The fabrics together are perfect. LOVE the colors and all the details. 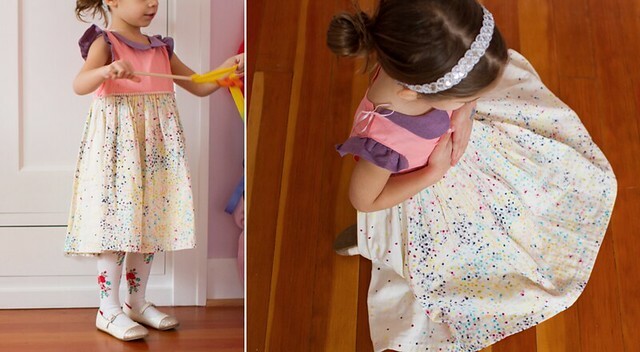 this is so sweet and girly, and exactly what my daughter would like to wear every day! 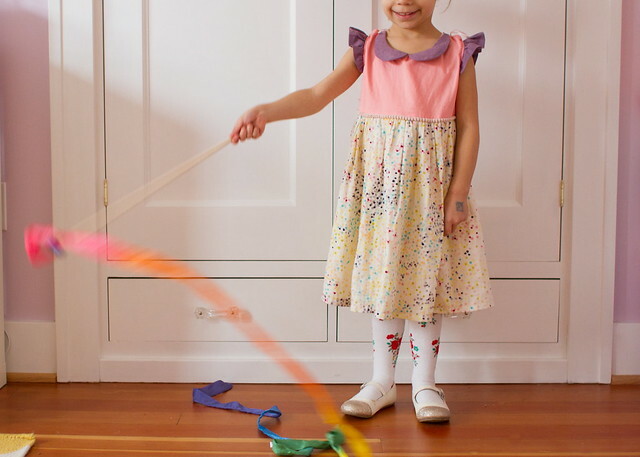 it’s so fun to make them happy… abd all it takes is some pink, some purple, and some twirl! i think it’s time i hop on board the nani train…. thanks! yes, exactly. oh and yes, get on the nani train. that stuff is not overhyped – it’s really beautiful. i just melt when i see it (and touch it!!). Wow- this is SO cute! I love the waist trim it’s adorable! I love this dress! The skirt fabric makes me want to swim in it. And I love that Em loves it so much. 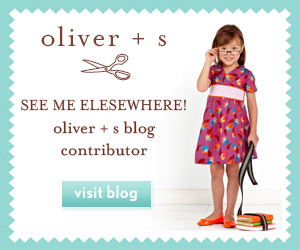 This reminds me that I have a quilt I finished last August that I need to blog about. Ha! I want to swim in it too! Thanks girl. Haha okay good, I feel better now. Having these unblogged projects bugs me so much though. OCD. Oooooh, I bet that double gauze feels so good when she’s twirling around! And I love the little shoulder bow. Way to make it work too when it came out too big at first!! Sometimes I just want to throw up my hands rather than figure out a solution. Good for you!! thanks carolyn! had to make it work, too cute to stick in a closet until it finally fit! Such a pretty dress! Love all the little details. That is so great that she loves the dress so much…I love when that happens as well! heeheehee! I love that you made her her very own dream dress! She’s such a doll! thanks for making this sweet dress and getting me on the nani train! it must be so fun to wear, no wonder she loves it! Oh fun. So nice to make something they really love. Nice to see the full skirt version. 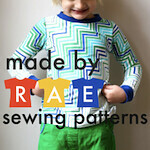 I actually discovered my little one’s top made from this pattern is a bit too small just yesterday, I’ve added it to my make another list! I see why she loves it! I need to make one! oh, this is so sweet. It’s perfect for her! Your little one is adorable in this and I can see why she loves it so much. That colorway is my favourite and it works perfectly with the purple and pink. My A would love this dress too. Think I will have to make one for her! What a sweet dress. That nano iro fabric is to die for. Em is a lucky little girl. Gah!! This is SO adorable! Beautiful work! 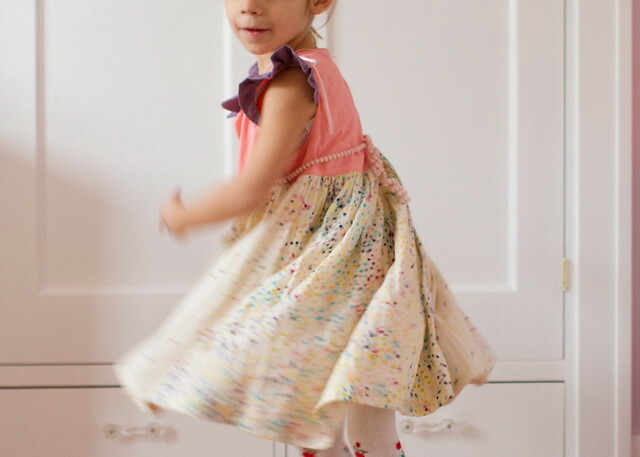 So cute and it’s the perfect little girl dress! And I really love all the details you added, making it all the more special. Lovely. Oh Kristen this is adorable! You are a good mom! that dress is truly magical!!!! I can’t imagine her not falling completely in love with it, Kristin!!! What a dreamy dress! 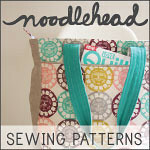 Sometimes those projects that stick in your mind and you just have to sew right now are the best. 🙂 Love the double gauze and that trim. that confetti fabric is so much fun. Cute Kristin! She is just so sweet in this! And that nani iro…..omG so gorgeous. Clover (who happened to walk by and say that this is a “very pretty dress”) loves polka dots too, which is something I can get behind a lot easier than her pink and purple obsession.